DCI contest coordinator/tabulator Keith Higgins submitted this picture back in June. 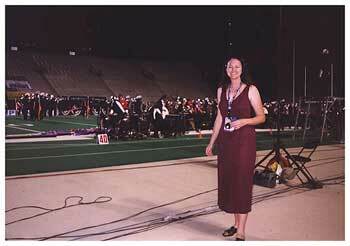 "This is Laura Higgins, a DCI event staff volunteer, in front of the Santa Clara Vanguard setting up for last year's championship finals. We had just found out a month earlier that we would be having a baby in March 2003. Little Lily will be about five months old when we all go to Orlando for championships this year. Laura and I have been working with the event staff since the 2000 season." Thanks Keith! Little 6-month-old Lily was a big hit at championships down in Orlando last week. Although we're not sure which corps is her favorite, we're confident she'll be a drum corps fanatic in a couple years. And DCI extends a hearty thank-you to all the volunteers who gave of their time last week.